One month from today, on 24th April, millions of people around the world will mark the fourth anniversary of the Rana Plaza garment factory collapse when 1138 people were killed near Dhaka, Bangladesh. In April 2014 Fashion Revolution Day was founded to ‘demand greater transparency in the fashion supply chain’ and to remember those who have been injured or have lost their lives making clothes for our high street stores. This year Fashion Revolution Week takes place from 24th to 30th April and is an opportunity for us all to ask questions about who makes our clothes. 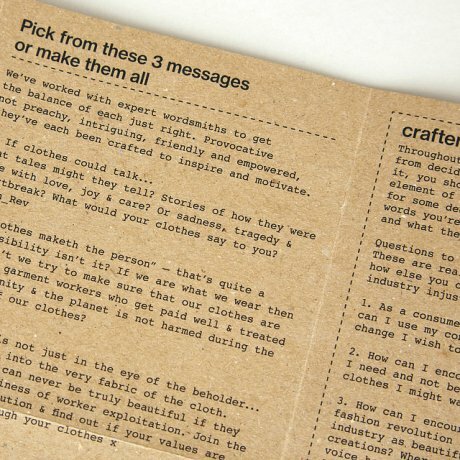 In support of Fashion Revolution, Craftivist Collective founder Sarah Corbett has thoughtfully developed a new Mini Fashion Statement Kit, which offers a beautiful and simple way for people to ponder the provenance of what they wear. Each kit includes a set of small scrolls on which the owner is encouraged to carefully write one of three ‘provocative but not preachy messages’. 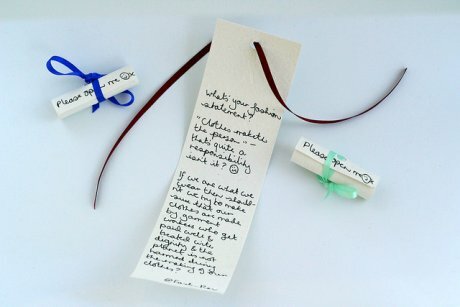 The scroll can then be tied with a ribbon and ‘shop dropped’ into the pocket of a garment in store or the favorite garment of a friend, colleague or family member. 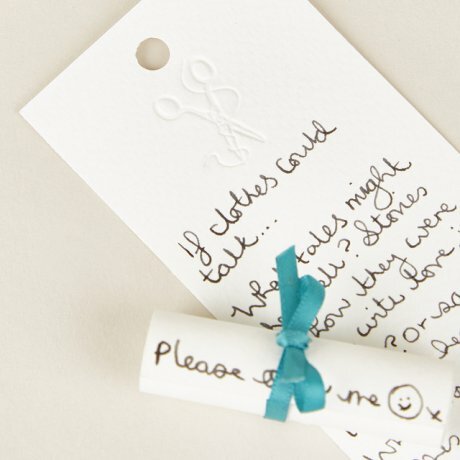 Throughout the process of writing your scroll, from deciding what to write to where to leave it, you should embrace the most important element of craftivism, peace and quiet. Use it for some deep, contemplative thought on the words you’re about to write/have just written and what they mean. Questions to keep you on track: These are really useful in helping you consider how else you could speak out against fashion industry injustices. 1. As a consumer I vote with my wallet. How can I use my consumer power to be part of the change I wish to see in the world? 2. How can I encourage myself to only buy what I need and not be tempted by all of the pretty clothes I might want? 3. How can I encourage others to join the fashion revolution and make all of the fashion industry as beautiful as the final clothing creations? Where and to who should I make my voice heard? Shop owners? Brands? friends? Businesses? Governments even? Price: £10 (includes a DIY kit and free gifts). Advance booking is recommended and tickets are available here. This is brand new workshop which takes place during the Joy and Dissent Festival, 'a festival of cultural activism'. Price: Free, a £5 deposit is required. Advance booking is recommended and tickets are available here (80p booking fee). Sarah is hosting this workshop as part of her School of Gentle Protest - she will launch a new vlog on the day which includes an interview with Orsola de Castro. 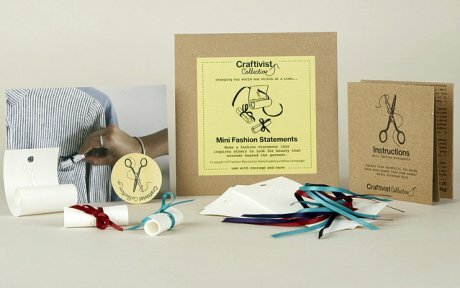 To find out more about the Mini Fashion Statement Kits visit Craftivist Collective’s website.